We believe in the old style of German Shepherd with level topline (not roachy or arched), strong hocks, powerful drive and tireless gait. If you are looking for a 'shapey' dog for the 'beauty show' ring - you are on the wrong site. 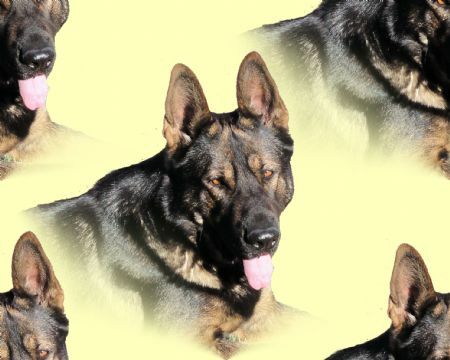 Our dogs are bred on strong working lines from awarded & recognised ancestors including schutzhund, obedience, police dogs, military dogs, security dogs from countries like the former Eastern Block, the USA and Europe. There are some 'show' champions in our pedigrees, although most of these would not be of 'show' type today. Health & Temperament are our number one priority. All of our breeding stock is tested and scored for Hip & Elbow displasia and all puppies are temperament assessed before being placed in new homes. Due to the strong character, intelligence and specialized breeding of our dogs, we cannot place high drive, working bred puppies in homes that have not owned a German Shepherd before, and we prefer owners who are familiar with the working bred type of German Shepherd. Our 'family' style Shepherd pups are available to homes that have owned a dog before, not necessarily a Shepherd. We don't believe that German Shepherds are suitable for first time dog owners. Puppies are rarely available, but enquiries are always welcome.